Briefly the property comprises: front open porch; inner reception hall; ground floor WC; lounge/ dining room; conservatory; kitchen; side canopy porch; first floor landing; master bedroom with en-suite shower room; two further bedrooms; bathroom; single integral garage with utility area; side attached carport with gated entry; front and rear mature gardens. 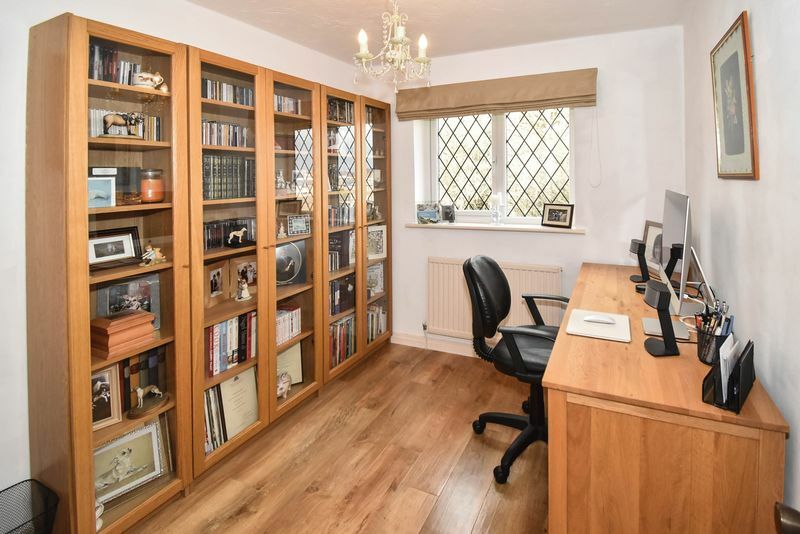 As we all know, house hunting is a challenging task which is all about compromise. 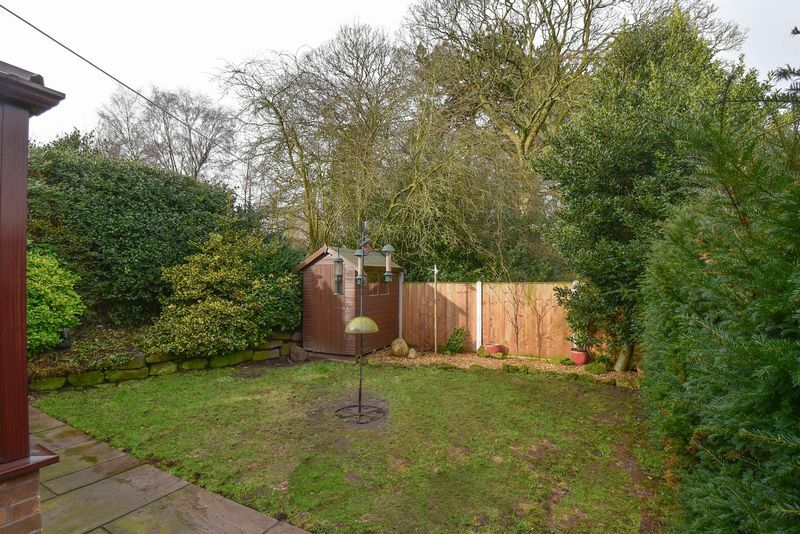 It can be the right size home but lacks an en-suite, or a fantastic home but lacking privacy. 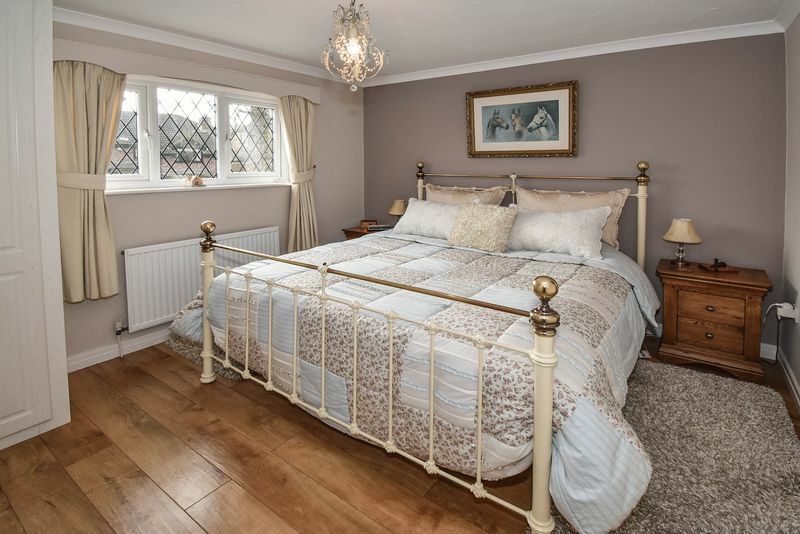 This is one of those lucky homes however, which seems to tick many boxes and represents a fantastic example for a property of this size and style. 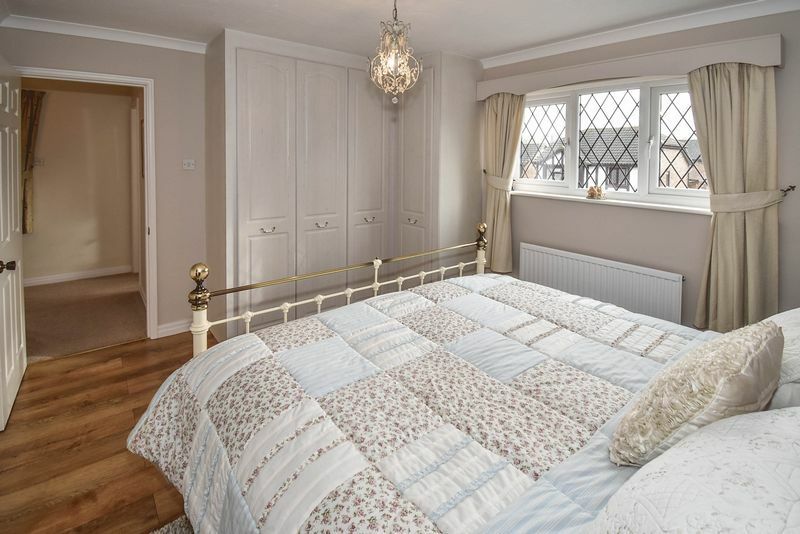 This is a cherished home, much loved and significantly improved by the current owners. Upon inspection it is immediately apparent through the evidence of careful preparation that is a home has been adored. 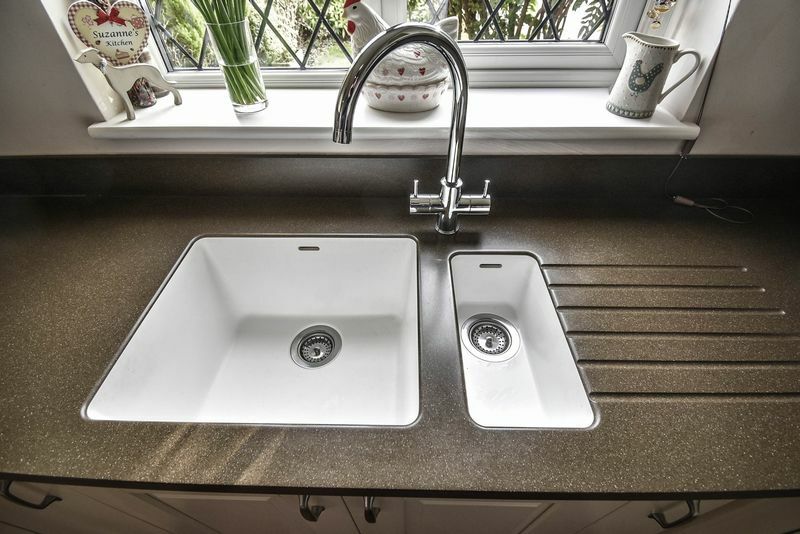 Firstly it is immaculate and in excellent decorative order from head to toe. Then beautiful hard floors have been installed, with the first floor featuring beautiful Karndeane style real look oak plank floors. 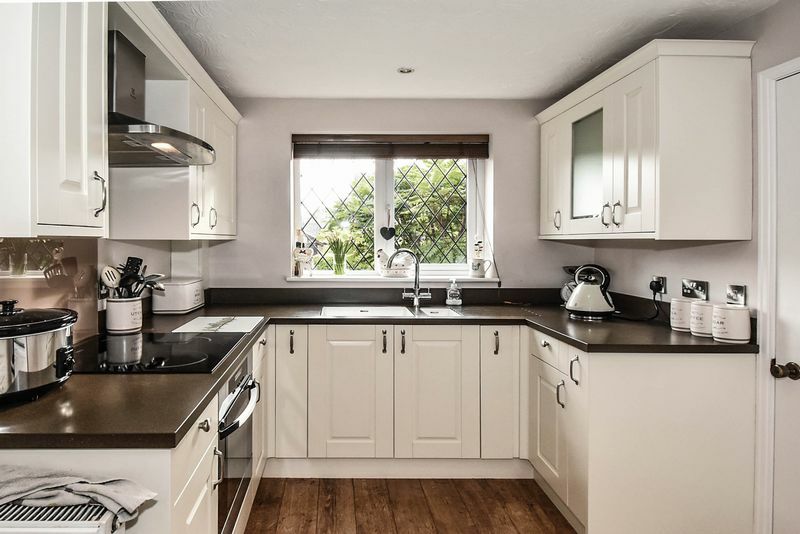 A superb quality kitchen has been installed with quality branded appliances, a good amount of detail added within its design and stunning Earthstone seamless preparation surfaces finish it all off beautifully. 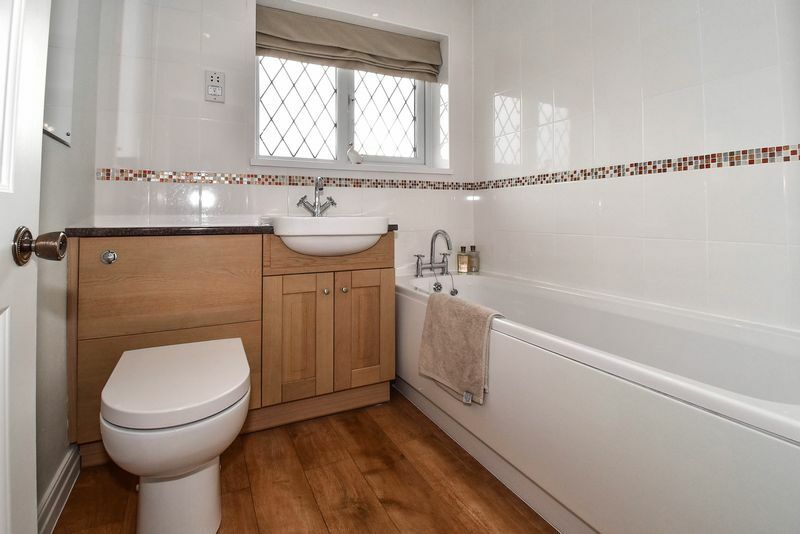 The family bathroom and master en suite have all been made over too with luxury sanitary ware, oak style cabinetry and beautiful tiling. 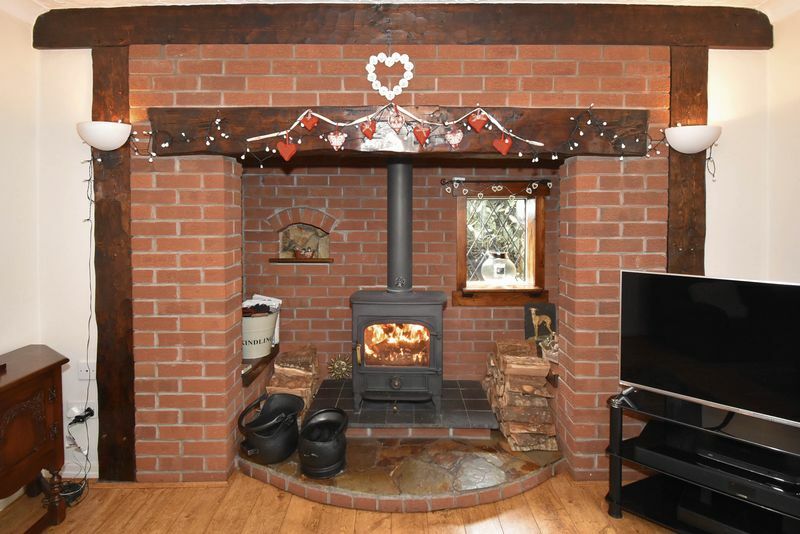 You will love your cosy nights in the lounge with your log burning stove roaring away within the characterful inglenook. There is little to do upon completion other than to start enjoying the property from day one. The property and its estate enjoys much inherent character, featuring homes of differing design in Cheshire brick and with all with a lightly period theme. The home is by property standards reasonably modern and thus enjoys the benefits of modern building techniques and materials. 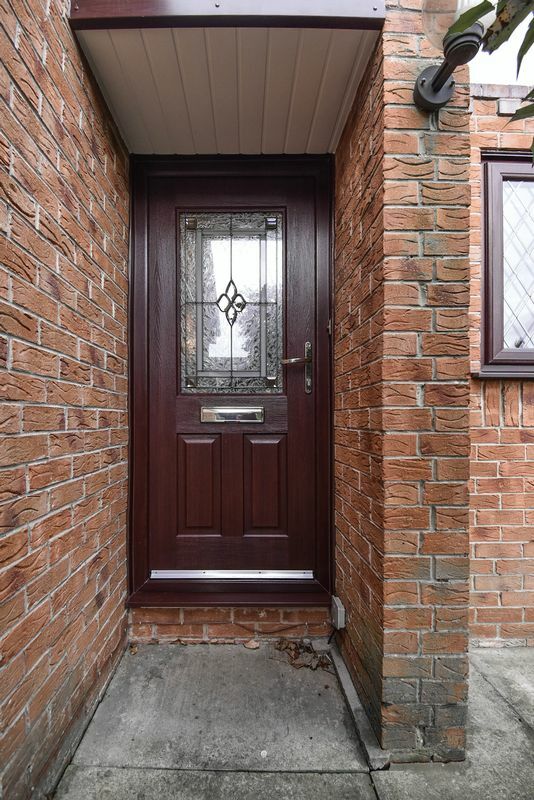 The windows, fascias, sofitts and external doors have all been upgraded to PVC with double glazing and a stunning front exterior Rockdoor has been lovingly selected. 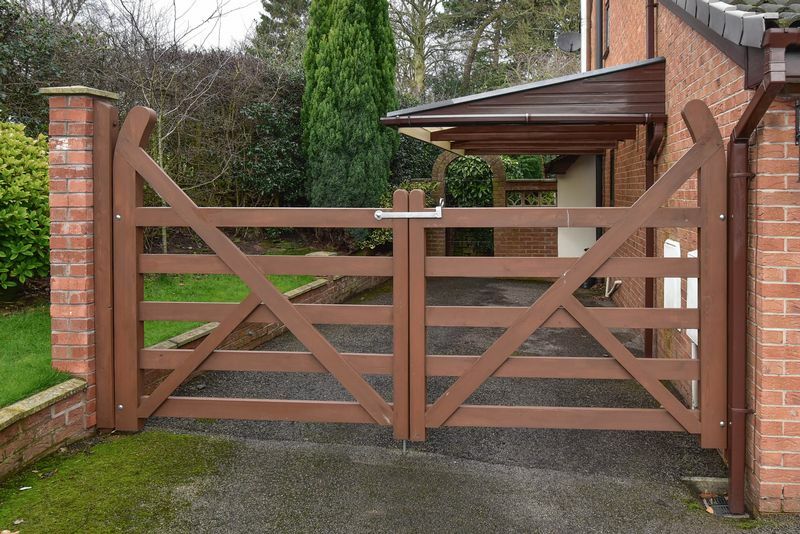 Attractive custom gates at the side provide secure access to the superb large attached carport. An attractive canopy porch sits over the kitchen side door. 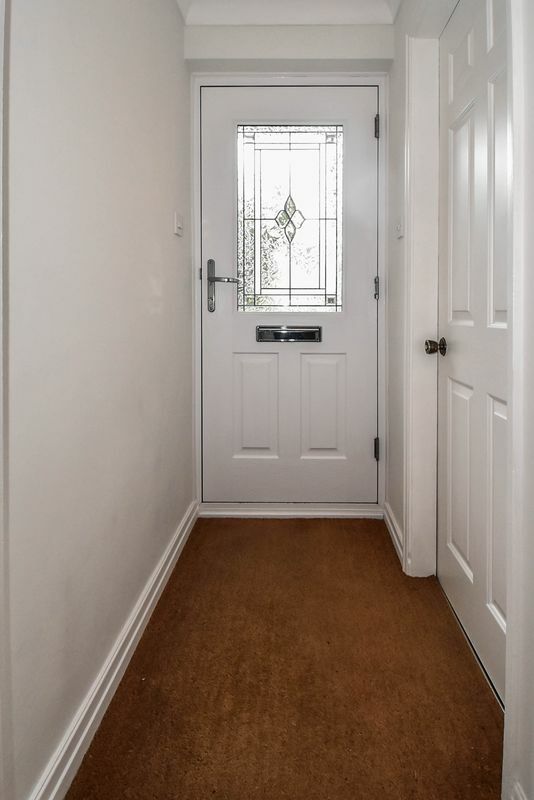 As you can see this well maintained home possesses many valuable extras which will reward you with practical use and durability during your occupation. 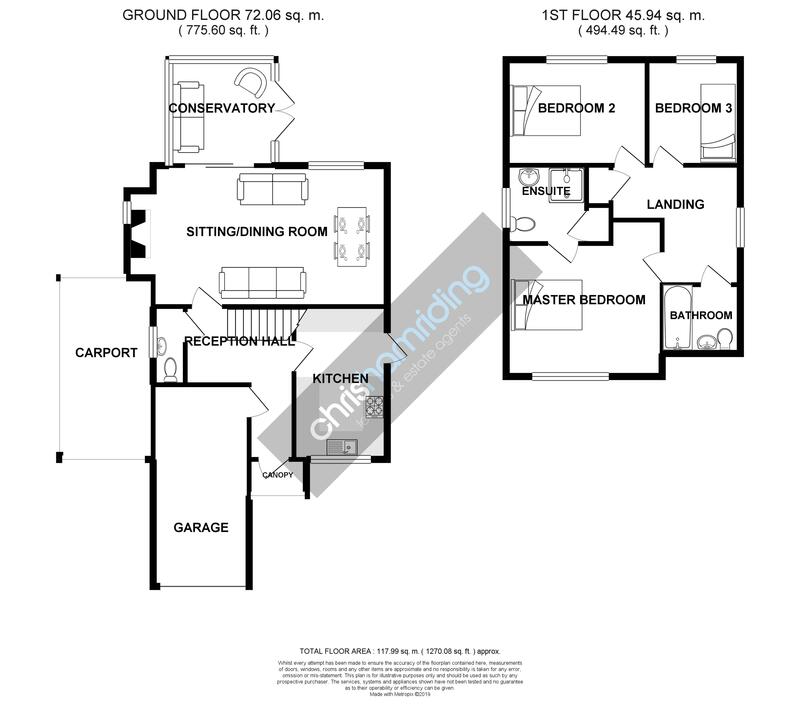 The home also features a high level of specification which will please the modern day demanding house buyer. Importantly, it firstly offers excellent living space and decent bedroom sizes. Intelligently designed, it also incorporates: a large inner reception hall and a spacious first floor landing; two built in storage cupboards to the first floor; internal access to the garage with utility area; front and side canopy porches; the master en-suite; conservatory addition; the super lounge inglenook. 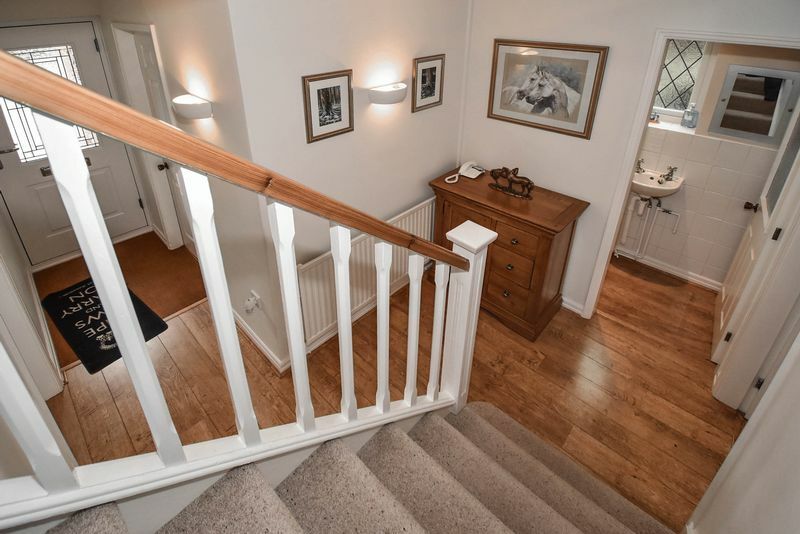 The staircase is centrally located to the home which means that it emerges away from the bedrooms and the bedrooms are bulkhead free and a better size as a result. 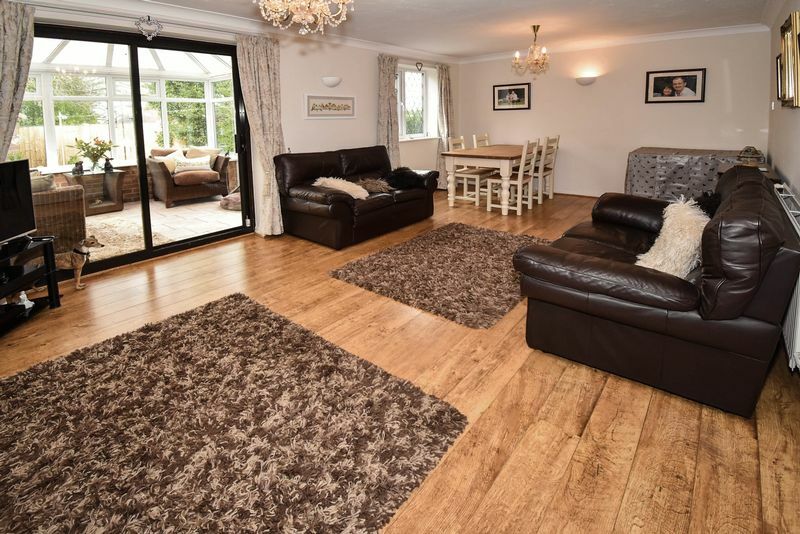 Externally the property has excellent driveway parking facilities, a large Indian stone dining terrace, plus attractive mature front and rear lawn gardens. 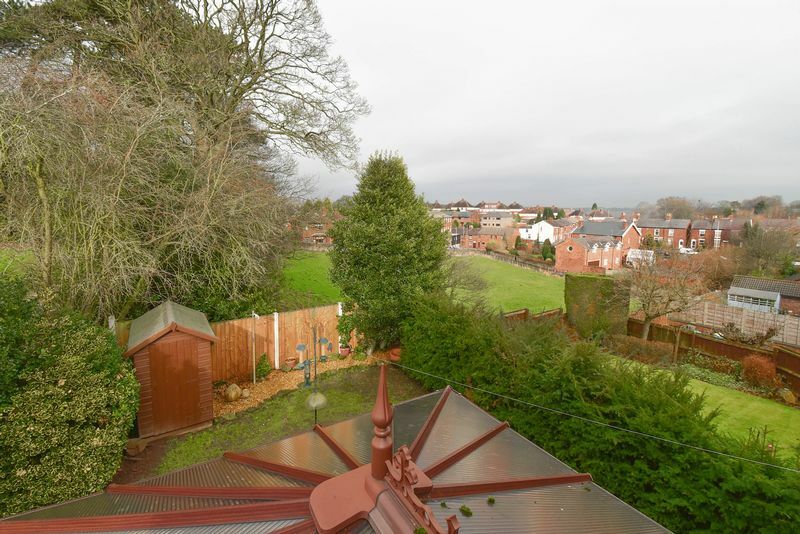 The home is tucked up out of the way at the end of the building line and is currently adjoining open countryside. Lets be honest, no view can be guaranteed these days, however, a line of mature trees at the rear does provide a very real obstacle for building directly at the rear of the home. Also, the home is elevated above the land at the rear which would assist with a privacy line of sight. But for now, while it lasts, you can enjoy the privacy and lovely views at the rear and side of the home. 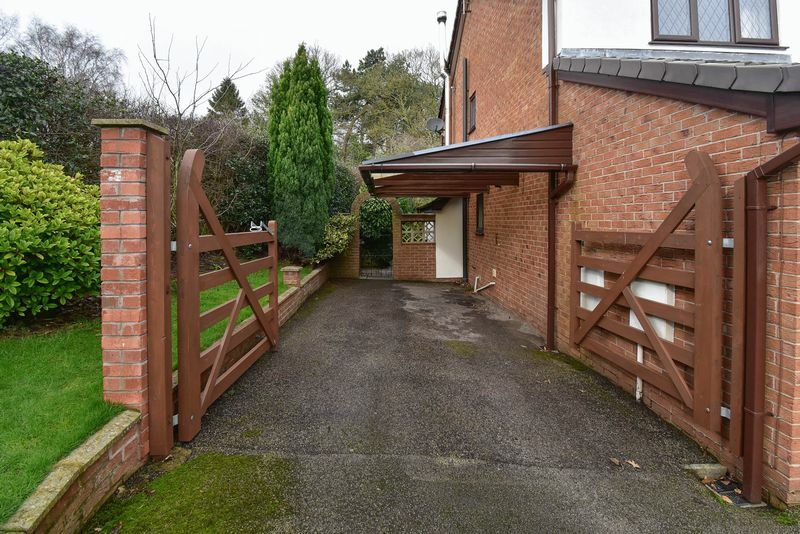 The property is within convenient walking distance to Congleton Town Centre and its many amenities. 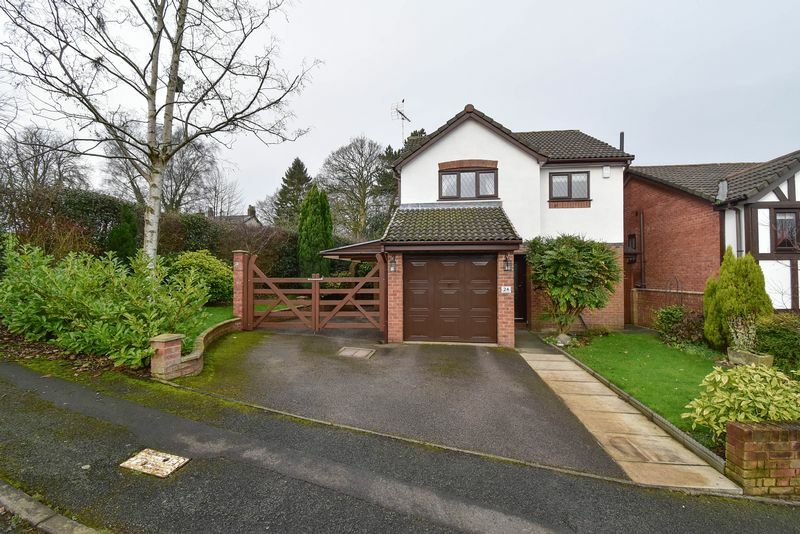 Its also on the right side of Town for Congleton Train Station and allows easy access to schools, bus routes and all major routes. 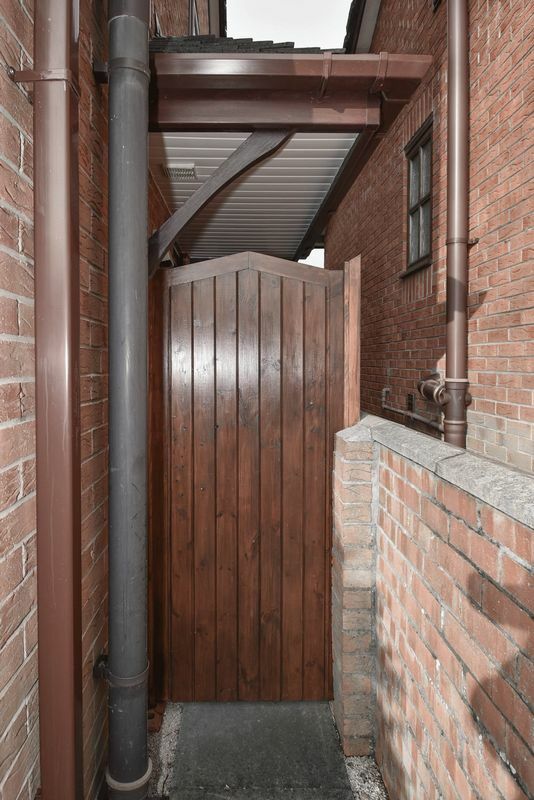 This is a property which will appeal to many differing markets. Its ideal for couple or small family occupation. 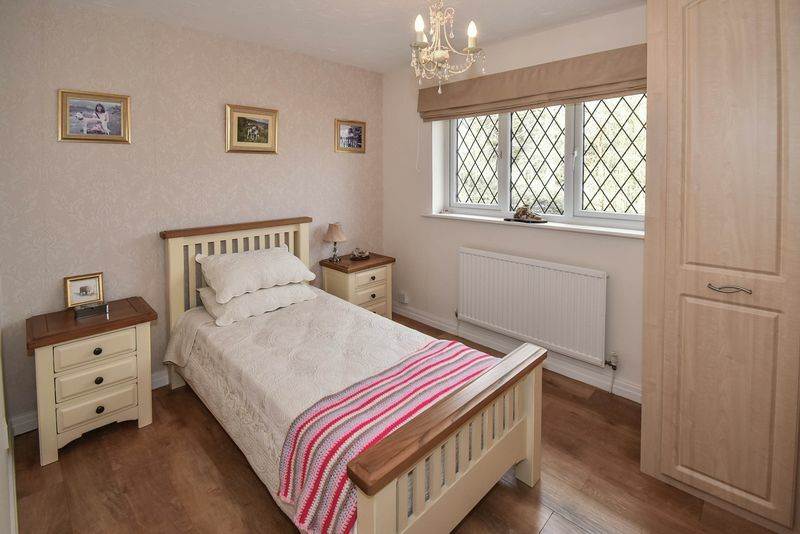 It will also appeal to down sizers where detached and high specification is a must have requirement and where its proximity to the town centre future proofs the move. Open covered recessed porch with PVC sofitts providing weather cover over the front door. Feature composite external 'Rockdoor' with ornamental bevel cut glazing opening to the reception hall. Entrance hallway area opening up to the inner reception hall. Matted floor entry area. Oak wood style floor. Spindle staircase to the first floor. Central heating radiator. 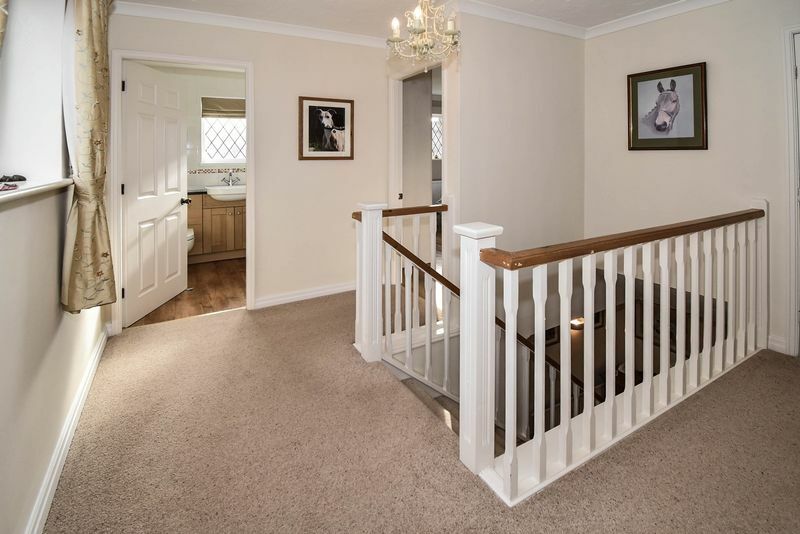 Access to the lounge/ dining room, WC suite, kitchen and garage. 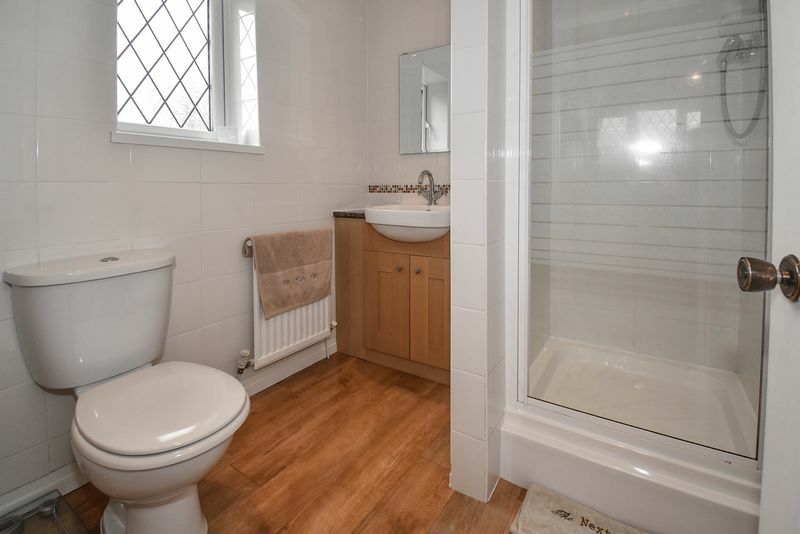 Modern refitted WC suite with: frosted PVC double glazed window at the side; button flush concealed WC; wash basin with chrome taps; chrome ladder heated towel radiator; oak wood style flooring; recessed ceiling down lighting; tiled walls. 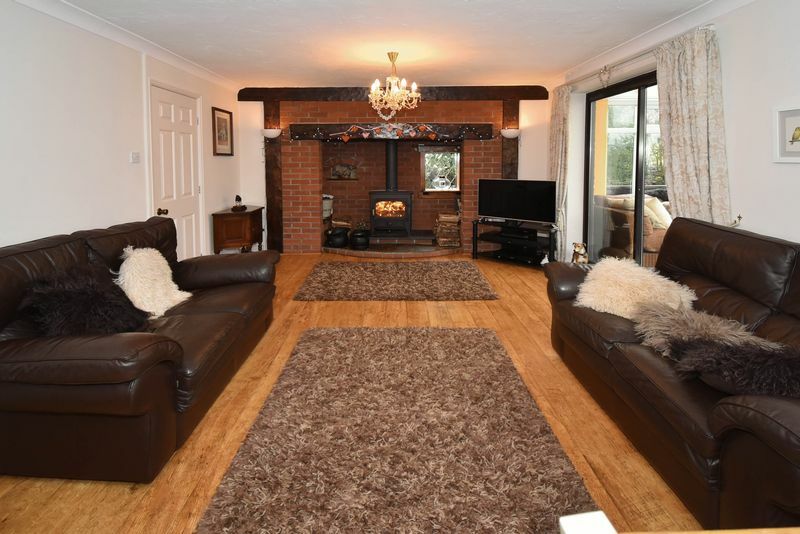 A beautiful room of immense character featuring a deep and wide inglenook recess housing a feature log burning stove, cosy nights in guaranteed! 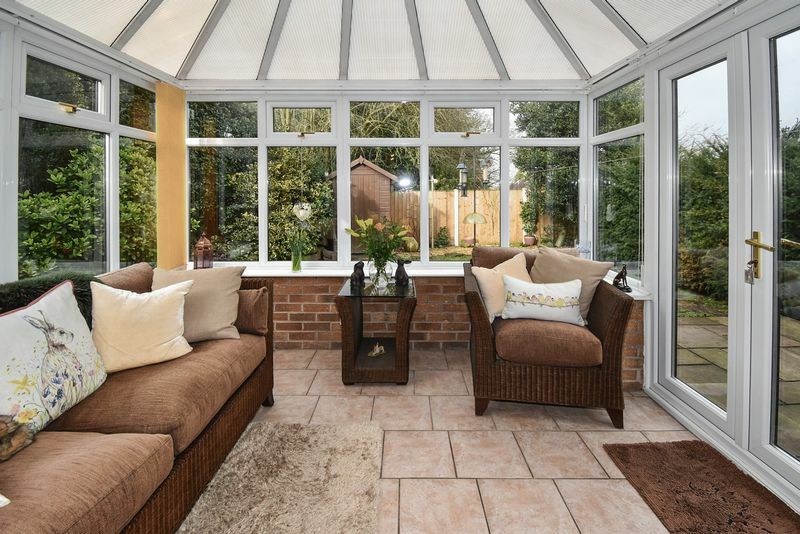 Bright room with PVC double glazed windows to the side and rear and double glazed patio door opening to the rear conservatory. Oak wood style flooring. Four wall mood light points. This depth of character and detail is very rare in properties of this style, its fabulous. PVC double glazed windows to three side and incorporating French doors opening out to the rear garden. Stone effect tiled floor. Electric heating and power sockets. Pleasant garden views. PVC double glazed window at the front and a frosted PVC double glazed external door at the side. Beautiful refitted cream traditional style kitchen suite with: stunning flowing and seamless Corian style 'Earthstone' preparation surfaces with integrated twin bowl sinks and machined drainer grooves (it's spectacular); polished chrome mixer taps; pan drawers; several slide-out spice rack wire storage units; quality branded Zanussi oven and ceramic hob; Elecrolux fan; Zanussi integrated dishwasher; recessed ceiling down lighting; oak wood style floor; central heating radiator; space for a fridge freezer. 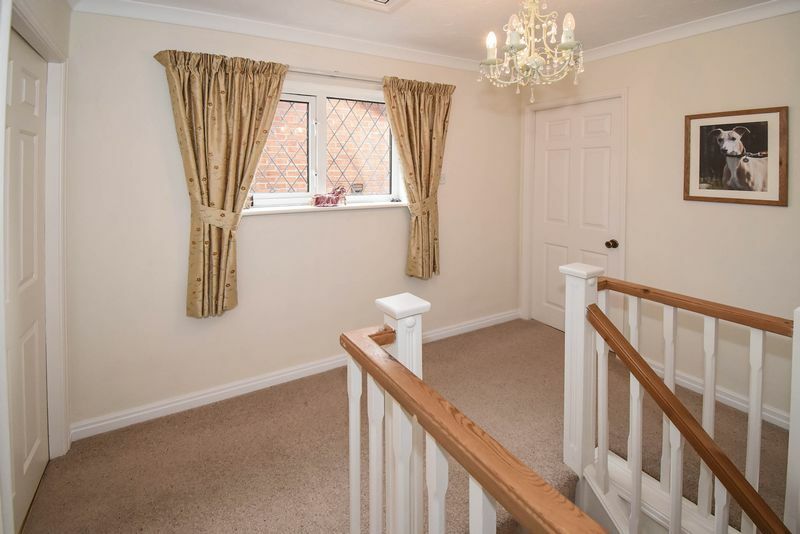 Spacious landing with a PVC double glazed window at the side. Spindle balustrade. Access to the loft with ladder and light. 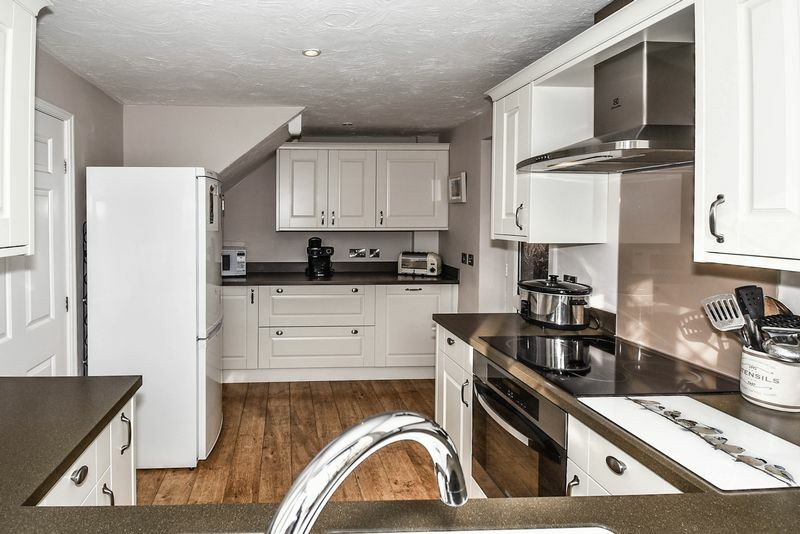 Access to the bedrooms, bathroom and a recessed storage cupboard. PVC double glazed window at the front. 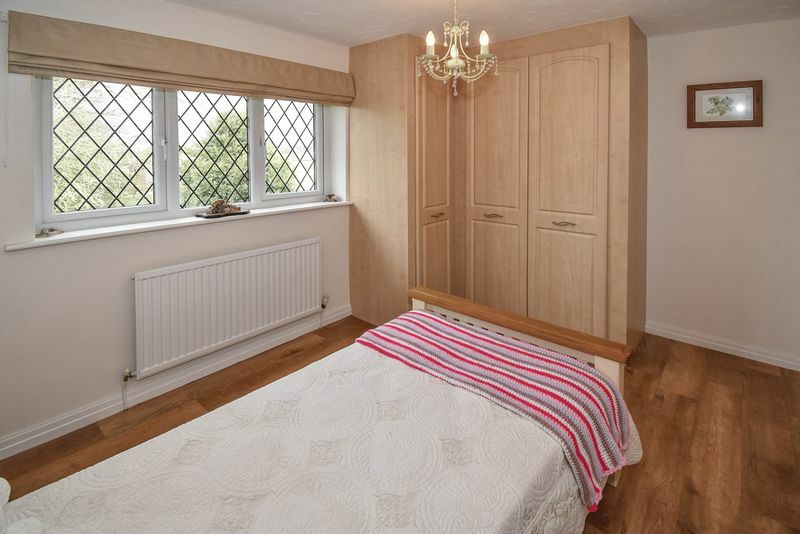 Built in wardrobes. Oak wood style flooring. Ceiling cove. 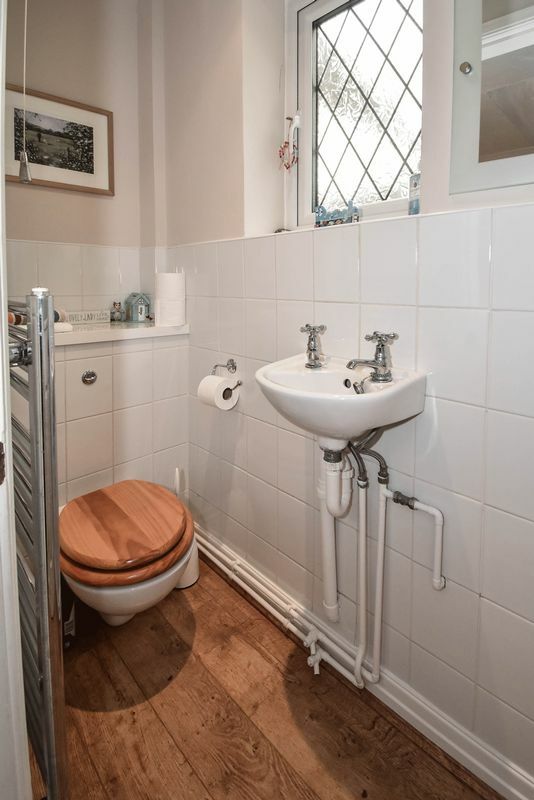 Access to the en-suite. Luxury refitted shower room suite comprising: frosted PVC double glazed window at the side; recessed shower cubicle with glazed door and thermostatic shower; oak wood style storage cabinets housing a wash basin with chrome mixer taps; button flush WC; shaver point; oak wood style flooring; recessed ceiling down lighting; central heating radiator; recessed built in storage cupboard. PVC double glazed window to the rear with views. Central heating radiator. Built in wardrobes. Oak wood style floor. PVC double glazed window to the rear with views. Central heating radiator. Oak wood style floor. Frosted PVC double glazed window to the front. Luxury refitted bathroom suite comprising: panelled bath with chrome mixer shower taps; oak wood style storage cabinets housing a concealed cistern button flush WC and wash basin with polished chrome mixer tap; modern white tiled walls with glass mosaic border tiles; oak wood style floor; recessed ceiling down lighting; central heating radiator. 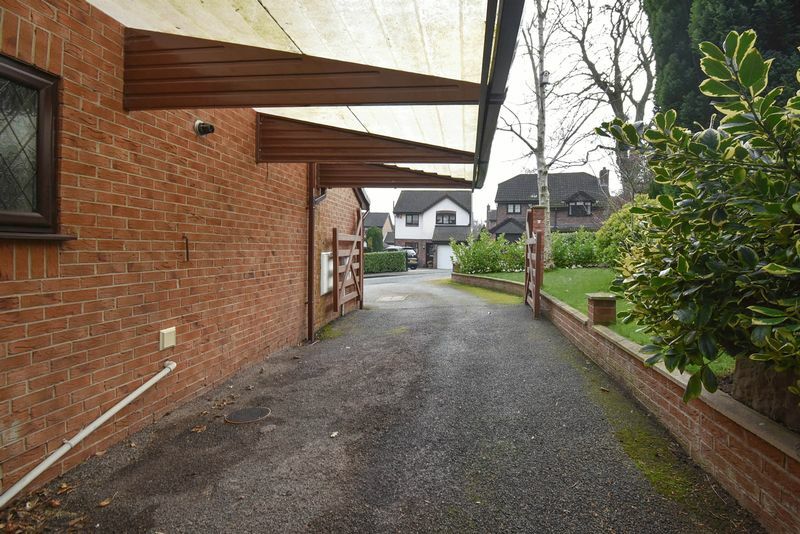 Attractive front and rear gardens with: driveway parking; carport; attractive custom gates with brick built pillar; Indian stone patio terrace; shaped lawns; mature stocked borders.